So you’re thinking about installing a temperature zoning system in your home. And you’re doing your research to find out what is involved, and can it really help you. Good for you! At Crystal Mechanical Services, we strongly believe in educating our customers. We feel that if you and our friends and neighbors in and around Philadelphia are fully aware of your options and the potential benefits then you are in a better position to make an educated decision about what you want done to the heating and air conditioning system in your home. And that helps us provide exactly what you want and need. Let’s go into detail so later you can address the all-important question: Do you need a temperature zoning system? The idea of a zoning system on your heating and air system is to allow independent control of separate zones, or rooms, of your house. To accomplish this each zone is set up with its own thermostat, and a motorized damper on the ductwork supplying air to that zone. When the thermostat in that room shows you need cooling (or heating, depending on the season) then it opens the damper and allows air into the zone. All the thermostats of all the zones in the house are connected to a central controller so that if any one of them is requesting air flow, then the central heating and cooling system is turned on. Now you may be thinking… “Wait a second. My HVAC repair guys are always reminding me to not close off vents in certain rooms because it isn’t good for my system or for efficiency.” And you are absolutely correct! That is because in a typical system the ductwork is not designed for zoning, and closing off a few vents will adversely affect the operation of the air conditioner or furnace. However, the difference in a zoning system is that there is a bypass duct installed to allow for proper airflow. A properly installed temperature zoning system needs a bypass duct or crossover duct. 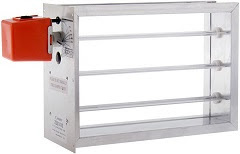 This allows for any air that is cut off at your zone dampers to bypass them and go back into the return air of the system. So the airflow at the furnace or air handler is not significantly reduced. Yes. If installed and used properly, system zoning can help you save money on your energy bills. If you have guest rooms or other seldom-used rooms that don’t require constant heating or cooling, system zoning allows you to save money by running temperature-controlled air to those rooms only when you want to. According to the U.S. Department of Energy, system zoning can save homeowners up to 30 percent on a typical heating and cooling bill. It is possible that within 2 to 5 years, the savings can pay for the cost of installing a zoning system. After that, you will be getting a return on your investment. There are not many HVAC items that can offer that kind of payback. However, to be realistic, you need to consider the following factors. To be truly effective, a zoning system is best when installed on a central heating and cooling system that has multi-stage or modulating operation, and variable speed airflow. Why? A properly designed zoning system takes full advantage of such systems by maximizing their low power operating modes. That’s when you really see savings. You may only need to run a multi-stage AC, Heat Pump or Furnace on its high-stage on extreme temperature days. So now… What about your specific home and situation? Does it make sense to install a temperature zoning system on your central heating and air? That’s coming up next! Want to ask us a question about a zoning system? Give us a call at 800-292-HVAC or visit our “Ask an Expert” page and fill out the form. Our resident expert will respond quickly with an answer.